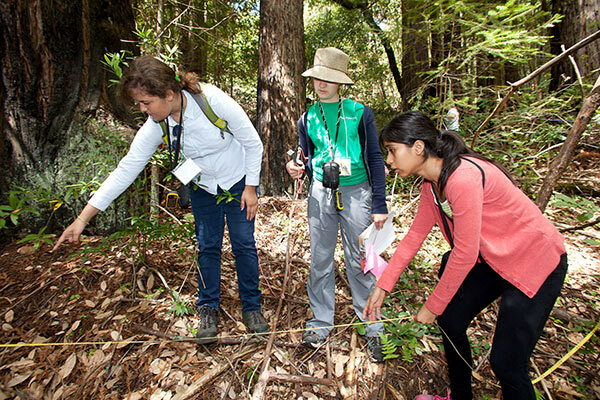 Imagine spending your summer in the forests of Pepperwood helping scientists better understand how our coastal redwoods are responding to a shifting climate. Picture having to lay on your stomach to take a great photo of a sparkling blue beetle. Every summer this is how over two dozen TeenNat interns do real on-the-ground science at Pepperwood. 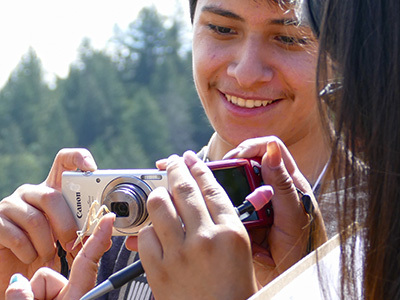 The TeenNat internship program engages diverse youth in citizen science, provides them with technical skills, and connects them to nature. Interns contribute data to Pepperwood’s Sentinel Site project helping researchers to better understand the distribution of plant and animals populations in Northern California. The TeenNat 2019 application period is now open! Click here to apply. Pepperwood’s nationally recognized five-week TeenNat summer internship gets teens outdoors and introduces them to the world of conservation science. TeenNat interns learn about ecological concepts like biodiversity and species distribution, and develop valuable skills including data collection and management. Throughout the internship they interact with researchers and other natural science professionals, gaining insights into career pathways. 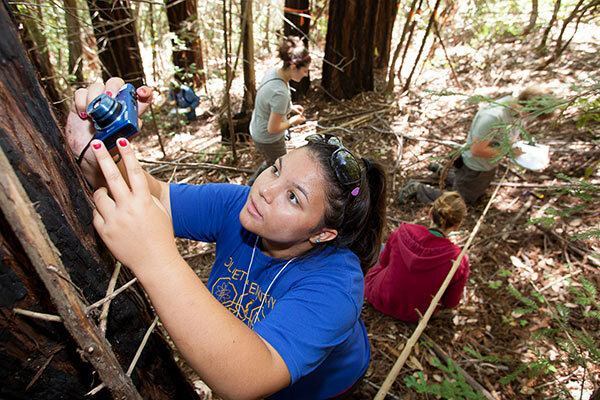 ABOVE: TeenNat interns collect data on Pepperwood's redwoods. Photos by Richard Morgenstein. 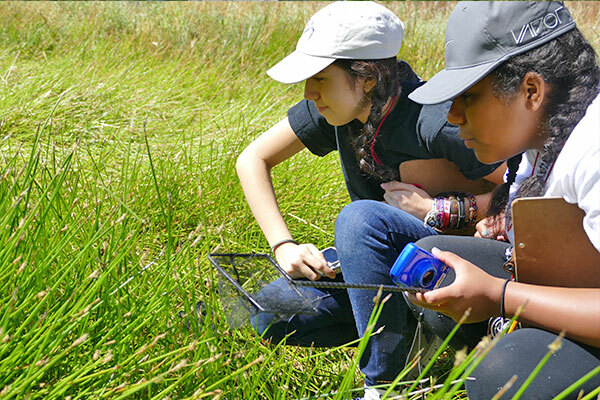 TeenNat interns gain valuable, real-world experience in conservation science. During field time, they are given instruction on the use of equipment, plant and animal identification, use of field guides, the nature of scientific inquiry, and wilderness safety. TeenNat interns also learn about natural science careers and the program includes a career day in which interns get to interview professionals. At the program’s close, the interns’ photos are shared via a public nature photography exhibit held in Pepperwood’s gallery. TeenNat interns are trained to use digital cameras and Global Positioning System (GPS) units to document plant and animal species and their locations via expeditions on the preserves. Interns learn how to use laptop computers to manage visual, written, and geographical data as they share, verify, and upload their observations to iNaturalist.org, a worldwide database for researchers and the scientific community. 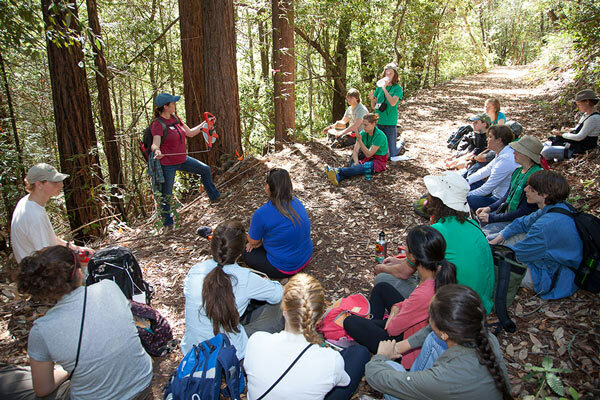 Each year, TeenNat interns also contribute critical data to Save the Redwoods League's Fern Watch and Redwood Watch citizen science projects. Upon completion of the summer internship, interns can elect to be part of the TeenNat Leadership Program. TeenNat Leaders commit to a greater level of service by continuing to gather biodiversity data, assisting new interns, participating in other citizen science initiatives, serving as volunteers at Pepperwood events, and writing about their experiences. They take part in other Pepperwood events including our Discover Nature lectures, and the Christmas Bird Count for Kids. They also assist with subsequent internships and help facilitate discussion on our TeenNat Facebook Group. 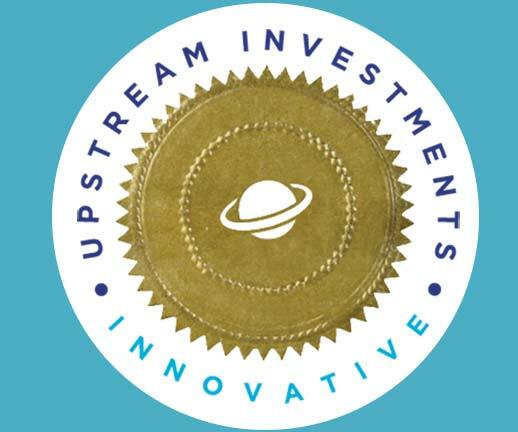 TeenNat was endorsed by Sonoma County's Upstream Investments Portfolio! The Portfolio is a select collection of local, evidence-based programs proven to help eliminate poverty in Sonoma County and ensure equal opportunity for quality education. TeenNat is made possible by the generous support of our members and donors. There is no charge to participate. Teens can apply by filling out an application available below. Applications are generally due in the beginning of April - see flyer below for exact dates and other important information. At the onset of TeenNat interns and their families are invited to take part in an orientation meeting in which new participants can mingle and families can set up carpools. TeenNat Flyer: dates, times & important info Apply Now - Online! Applications for TeenNat 2019 are due by April 1, 2019. If you apply online, you'll have the option to save your progress and finish the application later. Or click below to download an application in MS Word format to submit by email or fax. For questions or issues with the application process, please email teennat@pepperwoodpreserve.org. Esta pasantía gratis es una oportunidad para un grupo de adolescentes, de 13-18 años de edad para llevar a cabo las ciencias y el arte, mientras que explorar un preservo natural de 3,200 acres. Durante esta programa de cinco semanas los participantes adquirirán los conocimientos ambientales, aprendan habilidades técnicas, estarán activos afuera, y contribuirán a la investigación científica con la ayuda de nuestros científicos. No se preocupe si no tienes un paseo en coche. ¡Vamos a ayudar a establecer coche compartido para todos! Por favor llene completamente la aplicación electrónica que se encuentra abajo o puede descargar, imprimir y envíelo a Pepperwood antes del 1 de abril. Para más información envia un correo electrónico a Nicole: nbarden@pepperwoodpreserve.org. Se habla español y ingles.